This is the story of the Tomahawk Warrior crash that this author witnessed! It would probably surprise you if I said that a 40 second sliver of time and distance separates you all from what you are today, to nothing at all, to a non-existence, to not even be a thought in someone’s mind. A little dramatic perhaps but nevertheless, true. I have in the past mentioned to you that as a small boy I had just been through the blitz in London and later the V1 and finally the V2's were starting to come in when we left the city and came to live temporarily at an aunt's cottage in Loudwater near High Wycombe Buckinghamshire. Early one morning just as it was getting light, a plane roared overhead flying extremely low with its engines spluttering and in less than a minute a massive explosion rocked the building and the whole area. My brother Bob and step brother Tom said there was a plane crash, and we should all get up out of bed, and go to investigate. We ran up the hill of Derehams Lane toward where the crash occurred and it was there I saw the remains of a plane virtually unrecognizable as a plane at all! There were people running around with galvanized metal tubs picking up bloody body parts, and I re-call parachute silk being used to cover bodies or remains . As an almost nine year old it made a deep impression upon me. My brothers were trying to shield me from the gruesome scene although I had seen plenty of wartime in London. I was asking how could the airmen have been using parachutes? Obviously the plane had been too low for the crew to bail out. I now have the answer to that question. The chutes were now shrouds! It was an amazing coincidence that exactly on the 12th of August 2016 I came across the written history of that crash that had occurred on the 12th of August, 1944 while researching for a different story of WWII. Although it’s 72 years later, it validates everything I saw that fateful morning. A B-17 bomber of the USAAF 398th Bomb Group nicknamed “Tomahawk Warrior” took off from Nuthamstead for their 25th bombing mission when 2 of the four engines caught fire. This caused them to crash at Lude Farm in Penn just above Loudwater. When you read the official account of the flight that I have attached below, you will learn that the pilot Lt. Charles Searl, was making every effort to avoid crashing his plane in a populated area. He could not crash land in the large meadows nearby to our cottages because like many other large open spaces, they were covered in massive concrete pillars to prevent German invaders from using gliders to land troops. Lt. Searl saw the farmland and flew right over our cottage to get to it. Lude Farm is 1.5 miles from where we were staying and at the speed he was flying, probably around 150 miles per hour, it must have been approximately 40 seconds later he hit the ground. 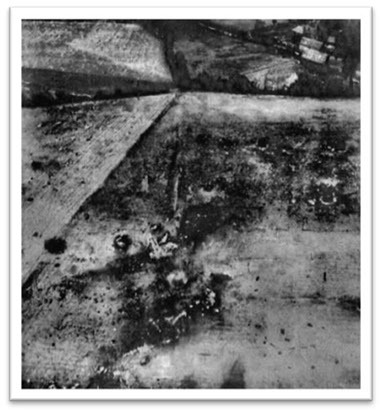 The effect of this plane load of bombs exploding on impact was of course far greater than any single bomb I had experienced in London. The noise and blast was felt for miles around. Had that plane not made it to the open farmland and had dropped on us in Loudwater, many people would have been killed, including ourselves. So we should all be thankful that America came to the rescue of Europe in WWII and for our family in particular, we must remember Lt. Charles Searl and his crew who bravely diverted his plane that morning so that we could enjoy the fruits of freedom from an oppressive government had the Nazi’s prevailed. I had written my book (see below)and dedicated it to WWII veterans long before I came across the record about this plane. Maybe it's part of my quest to thank those who served in helping to save Europe from tyranny. Author - Death Watch Beetle, A Historical Post WWII Spy Thriller. Courtesy of the 398th Bomb Group Memorial Assoclation. Saturday, 12 August 1944 - a B-17 bomber named the Tomahawk Warrior and nine young men came into the history of Penn forever. Many years have gone by - some of the elders of Penn who remembered that day have passed away and a new generation born. They can only read of the sacrifice made by the Tomahawk Warrior and her crew. 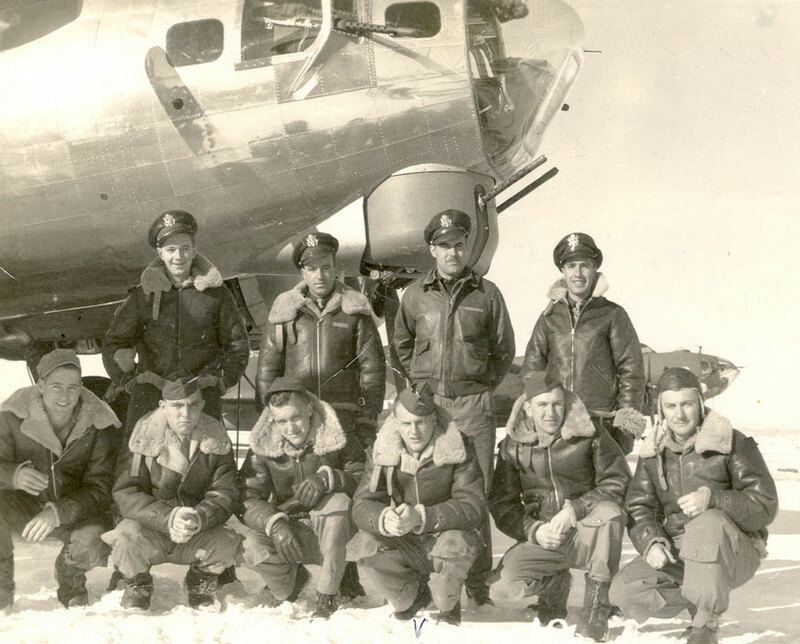 The nine young men who flew that morning died long before their time on their 25th mission. Only a few more to fly and they would have been going home to loved ones and a full and happy life ahead. their B-17's from Newfoundland to England to the allotted aerodrome of Nurthampstead near Royston in Herts where the countryside was very similar to that which surrounds Penn. To one crew their B-17 was special to them and as was usual the Pilot, Charles Searl, named it the Tomahawk Warrior after the small town where he lived. ranged from 20 to 27. They had come from many states across the USA... Wisconsin, Massachusetts, Michigan, Washington, D.C., Arkansas, Virginia, Ohio and New York. The Tomahawk Warrior flew many missions including a D-Day one to targets at Caen and Courseulles, France. Missions were interposed with leave which one supposes they spent in London. 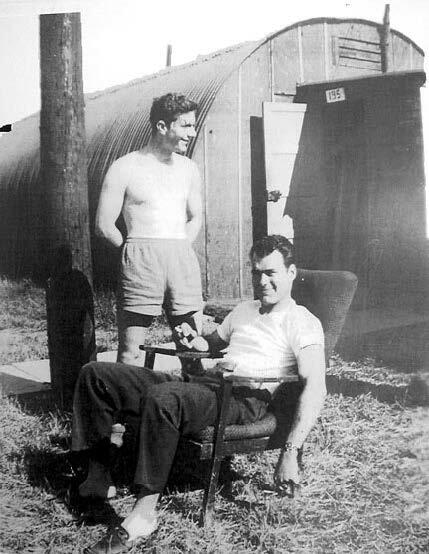 Their evenings would be spent at the local Inn just on the edge of the airfield and at Royston, the nearest small town. Entertainment would have been laid on at the base along with dances and there must have been invitations from the local population. 3. Photo Location: unknown, but probably taken before flight to the UK. 5. Information compiled by UK Friends of the 398th with thanks to Ron Setter (UK), Kenneth "Bert" Knight, and Glenn Knight, brother of Albert W. Knight, Waist Gunner. Photo scan from Glenn Knight. By June the Tomahawk Warrior had completed sixteen missions, all with the same crew. July recorded only five missions. During this month Charles Searl must have received news of the birth of a second daughter, sadly he was never to see. From August 1st the Tomahawk Warrior, still with her original crew, flew missions to France and Germany and on the morning of the 12th were on their twenty-fifth to Europe, Versailles, France. The day was dull and overcast with low cloud. Just before take-off, the tenth member of the crew stepped down from the flight. Ithas never been sure why. All that is known of him is his name and rank and after the Tomahawk Warrior crashed he was returned to America and so survived the war. No trace of him was ever found. The crew of nine took off at 0618. Formation was hazardous with the bad weather as the plane climbed to reach height. By 0700 the Tomahawk Warrior was heading out Southeast and already in trouble. One engine was seen to be on fire, and as it turned over the town of High Wycombe to return to base, a second engine was seen also on fire. Below in the town was the HQ of the 8th Air Force and most likely monitoring the mission. It has always been accepted that the pilot was trying to find open ground to attempt a landing when he had no chance of reaching his base or even Bovingdon airfield which was only ten miles away to the North. He would have seen the populated area he was flying over and realized the devastation the plane would cause if it crashed there. It skimmed over the farmhouse of Lude Farm and crashed into open fields opposite. Tomahawk Warrior and its crew of nine young men ended life in a massive explosion and fire. No one had bailed out of the stricken plane and no distress signal was ever traced. They stayed together, comrades now for all eternity. One of the crew was found in the lane and two at the edge of the fields. The rest were identified by their dog tags. A short entry in official records at their base read, 'Takeoff 0618 hours, 0720 no return'. Such a short epitaph. No investigation took place as to the reason for the crash. It was just one more casualty of war. General Doolittle, who was at the HQ in High Wycombe, visited the scene of the crash later in the day. The field where the Tomahawk Warrior crashed is the same today as it was (fifty-seven years) ago. Beautiful, peaceful and the seasons come and go. Itis an everlasting memorial to duty and sacrifice. They that died need no other. 4. Bombardier: Leo C. Walsh, Washington, D.C.
9. Tail Gunner: Orville M. Wilson, Washington, D.C. They were all buried in Cambridge Cemetery but after the war, in accordance with the wishes of their relatives, eight of them were re­ interred in Arlington Cemetery, America. They sleep amongst the highly honored in America. The one who was left behind, Albert Knight, also with his parent's wishes, is honored yearly by the Chiltern Aircraft Research Group on the anniversary of the crash with flowers and thoughts of the eight lying in their home country. Each Armistice Day Penn Church remembers them in the service and reads their names out along with others who gave their lives from the village. Small American Flags are placed along the path by the church door, each with the name of the Tomahawk Warrior's crew, and usually the Battle Hymn of the Republic is sung in honor. The Book of Remembrance in Penn Church has their names inscribed in glorious memory. To all who read this tribute, remember... they gave their lives just as bravely and in sacrifice for peace, just as those who were lost on and over the battlefields of Europe. 1. Photo contributed by: George E. Schatz, Elwood Crew Bombardier. completed our combat tour (August 8, 1944) we played ball with Charlie and Leo. The next day they were dead! The cottages we stayed in at Loudwater near High Wycombe after leaving London 1944. Still standing in recent years! The old bakery where the kids would gather to keep warm & smell the fresh bread & cakes. Lt Searl had a premonition he would not survive the war. Click here to read the last letter he wrote to his wife.